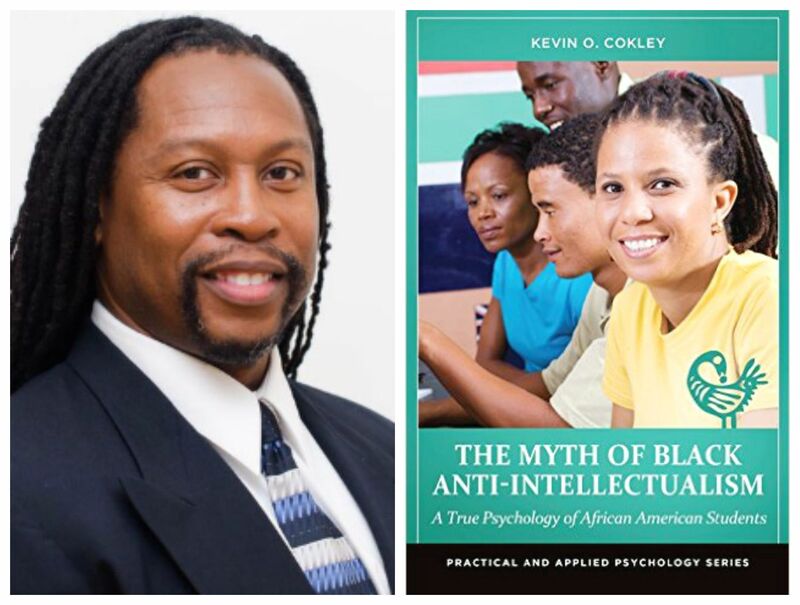 In this excerpt from the introduction to his new book, The Myth of Black Anti-Intellectualism: A True Psychology of African American Students, psychologist and professor Kevin Cokley delves into his own history as a high school and college student, and explores how the evolution of his academic identity intersected with his evolving racial identity. The book, which was published earlier this year, challenges the dominant narrative regarding black student achievement by examining the themes of black identity, the role of self-esteem, the hurdles that result in academic difficulties, and the root sources of academic motivation. In it, Cokley proposes a bold alternate narrative that uses black identity as the theoretical framework to examine factors in academic achievement and challenge the widely accepted notion of black anti-intellectualism. By high school, I had been identified as a “smart” student. I was in the highest-level classes that were available. I thought of myself as a good student, and fully embraced making good grades as a part of my academic identity. I never considered myself as one of those super-smart, academically gifted students who always made straight As. However, I considered myself an above-average, hard-working student. I made honor roll often, but not all of the time. I did not make the National Honor Society, a disappointment that lingered with me for several years. The defining moment in my young academic career were two programs called Medicine as a Career and Focus on Biology. They were summer enrichment programs geared toward academically gifted minority students (mostly African American) and Appalachian Whites (defined as Whites living in rural Appalachian areas who were presumably economically disadvantaged). The programs brought these students together for two and five weeks, respectively, on the campus of Wake Forest University. The purpose of the programs was to encourage more ethnic-minority and economically disadvantaged students to pursue a career in medicine. I had never been in a setting where there were large numbers of serious, goal-oriented, academically gifted Black students. The pride that I felt from my selection and participation in the programs was immeasurable. It was the first explicit experience that connected my identity as a Black student to my academic performance, and it changed me forever. When I completed the summer programs and returned home to get ready for school, I had a renewed sense of purpose. I also had a newfound resentment toward my White classmates, and toward living in a small, predominantly White “hick” town. My eyes were now open. I was angry because I felt that for years I had been deprived of the opportunity to reach my potential as a student. I was also angry because I had considered myself a special Black student because I was excelling in my classes. I realized that I harbored beliefs that Black students could not excel academically, and that I believed I was the exception. Living with a group of academically gifted Black students made me realize that I was, paradoxically, special yet not special. A whole new world of possibilities had been opened to me, and my racial and academic identities became more solidified. I had developed a new racial consciousness, and I was now empowered to be more vocal on race-related issues, while other Black students continued to sit back passively. I was ridiculed by certain Black and White students for being too militant, which only fueled my emerging Black consciousness. Wake Forest University is a small, highly selective private liberal arts school filled mostly with upper-middle class White students. Being accepted there—the first Black student from my high school ever to do so—was a very proud moment in my life. Within the first couple of days of college, I was approached and asked by some White students if I was a football player. I responded by saying no, and proudly pointed out that I was there on academic scholarship. It was a rude awakening to what would be the first of many “encounters” that the African American psychologist William Cross would describe. I can vividly recall those first few days of college walking in the quad area and seeing a Confederate flag displayed from the dorm room of the Kappa Alpha Order fraternity. That flag was a constant reminder of the history and culture of Wake Forest and the old South, and a reminder that African American students were ethnic and racial minorities in an overwhelmingly White and sometimes unwelcoming environment. Like many first-year college students, I was overwhelmed with the freedom I had to go anywhere I wanted, stay awake as long as I wanted, and pretty much do anything that I wanted. Academically, I could take whatever classes I wanted. Also like many first-year college students, I was pre-med, and I took biology, chemistry, psychology, and Latin in my first semester. After having attended two summer enrichment camps that were geared toward increasing the number of ethnic minorities in medicine as a career, I was certain that this was my destiny. However, biology and chemistry changed my destiny! I struggled mightily in those classes, and ended up failing both classes while making Cs in my psychology and Latin classes. This was a rude awakening to the beginning of my college experience. I lost my academic scholarship, and was immediately placed on academic probation after my first semester. Never had I experienced such academic struggles before. A wave of self-doubt suddenly surrounded me, and my academic self-concept was shaken to its core. Had I bitten off more than I could chew? Was I not smart enough to be there? Did I really belong? If I flunked out of school, it would embarrass not only me, but my family. My parents were extremely proud that I was attending Wake Forest University. Black students from my hometown, Pilot Mountain, were not supposed to be academic achievers. We were not supposed to go to colleges like Wake Forest University. If I flunked out, I would be confirming the doubts of all the naysayers who (I and my family believed) wanted me to fail. The atrocious start in my first year haunted me for my entire four years of college. The truth of the matter was that I really was not as academically prepared as I should have been to do well in college. I did not know how to study effectively, nor did I know the amount of time that was needed to thoroughly master the information being presented in classes. I did not understand the importance of scheduling regular meetings with my professors to discuss material that I did not understand. For that matter, I did not even always know what I truly understood and what I did not. I rarely sought academic help, and when I did, I could not help but feel self-conscious about being a Black student who needed academic assistance. My academic self-concept took a beating during those four years of college, and left me wondering what my future held in store. During the time that my academic self-concept was taking a beating, my racial consciousness and Black identity was growing. I entered Wake Forest already having a pretty strong Black identity that had been enhanced by my experiences in the two summer enrichment programs at Wake Forest. However, college is an experience in which racial and ethnic differences are often emphasized to a degree not seen in high school. There are numerous student organizations based on racial and ethnic identities and themes. Additionally, famous and provocative speakers are routinely brought to campus to stimulate and foster dialogue on important racial issues. I immediately became involved in the Black Student Association (BSA), a staple organization seen on many predominantly White college campuses. I also joined the Gospel Choir and later a Black fraternity. The BSA was the center of social and political activity for Black students on campus. One of my most vivid memories of the BSA was protesting South African apartheid. The BSA had partnered with another organization to stage a dramatic enactment of apartheid activity in the student cafeteria. When given a sign, several Black males (myself included) walked to several seemingly unsuspecting White females (who were actually willing participants in the demonstration), grabbed them out of their seats and dragged them away. The reaction was swift and dramatic. Several white males stood up, clearly angered and disturbed by what they were witnessing, and demanded that we stop. At this point, a member of the BSA stood in front of the cafeteria and made a statement about apartheid, indicating that what people had just witnessed was a regular occurrence to Black people living under the brutal regime of South African apartheid. The adrenaline rush that I received from participating in this demonstration was incredible. More importantly, it was an influential experience that contributed greatly to my emerging critical racial consciousness. Two speakers were brought on campus who had perhaps the greatest influence on my critical racial consciousness and increasing pride in my racial identity during college. These speakers were Jawanza Kunjufu and Na’im Akbar. Jawanza Kunjufu is best known for his book Countering the Conspiracy to Destroy Black Boys. Na’im Akbar is a highly regarded and outspoken Black psychologist who advocates an Afrocentric philosophy to understand the conditions and psychology of Black folks. The impact that hearing these two men speak had on my racial identity was incredible. Both men exuded a confidence, racial pride, and sense of purpose and commitment to Black people that I had never witnessed before. Na’im Akbar (or Baba Na’im, as he is affectionately called) was especially influential, as he sowed the early seeds of what would become my embrace of Afrocentric psychology. Years later, I attended my 20-year class reunion. I was excited to see friends and acquaintances whom I had not seen in many years. One of these individuals was a White female named Tina. Tina had attended high school with me, and we ran track together both at East Surry High School and for a summer track club. We were also in all of the same advanced classes, and played in the band together. We were close friends in and out of school. Our lives were remarkably parallel in academics and athletics, so it was no surprise that we both applied and were accepted to Wake Forest University. Once Tina and I started college, however, our paths rarely crossed outside of track. We were not in the same student organizations, and we did not socialize together. We had never talked about this, and in fact we had very few conversations while attending Wake Forest. 20 years later, I contacted Tina via Facebook and arranged to meet with her at our 20-year class reunion. During dinner, we reminisced about old times, especially the traumatic false start that I had in high school. Then a conversation that I did not anticipate took place. Tina indicated that something had been bothering her for so many years, and she had always wanted to talk with me about it. She basically wanted to know what happened to us. Why didn’t we stay close while in college? I thought about her question very carefully. I do not think I had ever really thought about it much, and as I was reflecting on her question, the answer became obvious. I decided to be very candid with her, and responded by saying that I essentially discovered my Blackness in college. I lapsed into a mini-lecture on the psychosocial development of Black college students, and how my racial identity was impacted by attending a predominantly White school. I talked about the importance of being around other students similar to myself, and the importance of belonging to Black student organizations for my racial identity. I also talked about my academic struggles, and the fear of failure that I thought would be attributed to being Black. By the time I was a senior, I did not know what my future held in store for me. I did not think my grades were good enough to get accepted into any graduate program in psychology, so I never considered that a viable option. I participated in the job fair and hoped that my resume would be attractive to some company. I was encouraged when a pharmaceutical company contacted me for an initial interview. Later, I received another invitation for a second interview. I was very excited, and thought that I might actually have the chance of having a job waiting for me upon graduation. However, a third interview did not happen, and a job offer never materialized. As I reflect on my college years, I see that my time at Wake Forest was marked by two distinct experiences: one of academic struggle, and one of emerging Black consciousness. It is no accident that these themes would later define much of my scholarly work on African American students. Dr. Kevin Cokley is a professor in the Department of Educational Psychology as well as the Department of African and African American Diaspora Studies at The University of Texas at Austin. In addition to his extensive background in academic research, Dr. Cokley serves as the editor-in-chief for The Journal of Black Psychology and director of the Institute for Urban Policy Research and Analysis.